Installing Communication server required PERL modules. Database server, which stores inventory information. Communication server, which handles HTTP communications between database server and agents. Administration console, which allows administrators to query the database server using their favorite browser. 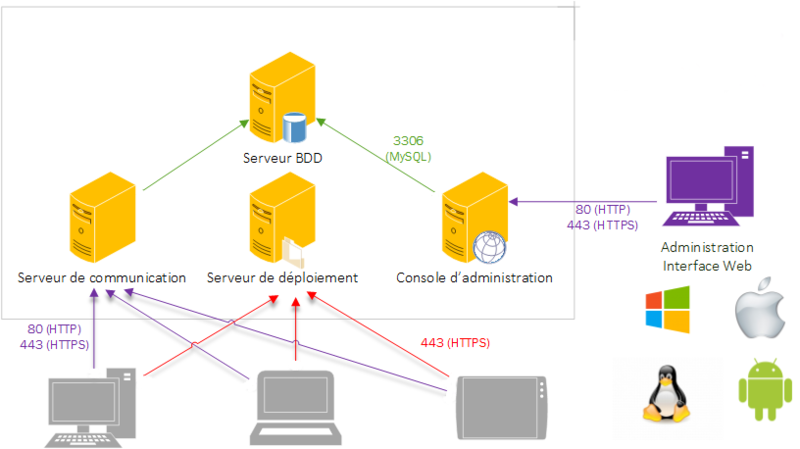 Deployment server, which stores all package deployment configuration (requires HTTPS!). These 4 components can be hosted on a single computer or on different computers to allow load balancing. Above 10000 inventoried computers, we recommend using at least 2 physical servers, one hosting database server + Communication server and the other one hosting a database replica + Administration server + Deployement server. Figure 1 : OCS Inventory NG communication architecture. Database server currently can only be MySQL 5.4 or higher with InnoDB engine active. Communication server needs Apache Web Server 2.2.X / 2.4.X and is written in PERL as an Apache module. Why? Because PERL scripts are compiled when Apache starts, and not at each request. This is better performance-wise. Communication server may require some additional PERL modules, according to your distribution. Deployment server needs any Web Server with SSL enabled. Administration console is written in PHP 5.6 (or higher) and runs under Apache Web Server 2.2.X /2.4.X. Administration console requires ZIP and GD support enabled in PHP in order to use package deployment. MySQL or MariaDB database server running somewhere and listening on default port 3306 with TCP/IP communication enabled. Apache Web server installed and running for Communication server and Administration server. PHP and Perl installed and usable by Apache Web server for the Administration console. Perl and mod_perl installed and usable by Apache Web server for the Communication server. Apache version 2.2 or higher. PHP 5.5 or higher, with ZIP and GD support enabled. MySQL or MariaDB version 4.1.0 or higher with InnoDB engine active. Mysql version upper than 5.5 are not supported but may work. Note: OCS Inventory NG Server Setup will check for all these components and will exit if any are missing. Warning: You must have root privileges to set required perl modules up. It is better for system integrity to use your distribution's precompiled packages when they are available. Some of these packages are only available inEPEL. Note: On Fedore/Redhat/Centos 7 the package " Apache DBI " wasn't in the repo EPEL you can find the rpmhere. You also need to install GD support for PHP. You must have root privileges to set OCS Inventory Server up. Note: Ensure MySQL InnoDB engine is activated on your database server. Open my.cnf and ensure there is no line “skip-innodb” or this line is commented (begins with ‘#’). Download latest version of server tarball “OCSNG_UNIX_SERVER-2.4.x.tar.gz” from OCS Inventory Web Site. Run “setup.sh” installer. During the installer, default choice is presented between . For example, [y]/n means that “y” (yes) is the default choice, and “n” (no) is the other choice. Note: Installer writes a log file “ocs_server_setup.log” in the same directory. If you encounter any error, please refer to this log for detailed error message. Warning: If you’re upgrading from OCS Inventory NG 1.01 RC2 and previous, you must first remove any Apache configuration file for Communication server. Type “y” or “enter” to validate and, then enter MySQL server host address, in most cases localhost. Then, setup checks for MySQL client binary files version 4.1 or higher. If not present, you will be prompted to continue or abort setup. If all is OK, enter MySQL server port, generally 3306. Where is Apache daemon binary [/usr/sbin/apache2ctl] ? Enter or validate path to Apache daemon binary, generally “/usr/sbin/apache2ctl”. It will be used to find Apache configuration files. Note: If you’re not using system Apache daemon, but another one like XAMPP/LAMPP Apache server, you must enter full path to your Apache daemon, not the system one. Enter or validate Apache main configuration file path, generally “/etc/apache2/conf/apache2.conf” or “/etc/httpd/conf/httpd.conf”. Enter or validate Apache daemon running user account, generally “apache” or “www” (under Debian/Ubuntu is “www-data”). Enter or validate Apache daemon user group, generally “apache” or “www” (under Debian/Ubuntu is “www-data”). Where is PERL interpreter binary [/usr/bin/perl] ? Next, setup checks for PERL interpreter binaries. Enter or validate path to PERL interpreter. Note: If you’re not using system perl interpreter, but another one like XAMPP/LAMPP perl interpreter, you must specify full path to this perl interpreter, not the default system one (/opt/lampp/bin/perl generally used in XAMPP/LAMPP). Common information for setting up Communication server or Administration console is now collected. Setup prompts you if you wish to set Communication server up on this computer. Enter “y” or validate to set Communication server up, “n” to skip Communication server installation. Setup will then try to find make utility. If it fails, setup will stop. Setup will next try to determine your Apache mod_perl version. If it is not able to determine mod_perl version, it will ask you to enter it. Note: You can check which version of mod_perl you are using by querying your server's software database. Under RPM enabled Linux distribution (RedHat/Fedora, Mandriva…),run rpm –q mod_perl. Under DPKG enabled Linux distribution (Debian, Ubuntu…), run dpkg –llibapache*-mod-perl*. Communication server can create detailed logs. This logs can be enabled by setting integer value of LOGLEVEL to 1 in Administration console menu Configuration. Where to put Communication server plugins configuration files [/etc/ocsinventory-server/plugins] ? Warning: If any of these modules is missing, setup will abort. Where do you want the API code to be store [/usr/local/share/perl/5.24.1] ? Configure Communication server PERL module. Build Communication server PERL module. Install Communication server PERL module into PERL standard library directories. Create Communication server log directory (/var/log/ocsinventory-server by default). Creating Communication server plugins configuration directory (/etc/ocsinventory-server/plugins). Creating Communication server plugins Perl directory (/etc/ocsinventory-server/perl). Create Apache configuration file (ocsinventory-server.conf). If you are using Apache configuration directory, this file will be copied under this directory. Otherwise, you will be prompted to add content of this file to the end of Apache main configuration file. To ensure Apache loads mod_perl before OCS Inventory NG Communication Server, Setup can name Communication Server Apache configuration file 'z-ocsinventory-server.conf' instead of 'ocsinventory-server.conf'. ```Do you allow Setup renaming Communication Server Apache configuration file to 'z-ocsinventory-server.conf' ([y]/n) ? **`Warning: Do not add content to apache main configuration file if it is not a fresh install! # Path to log directory (must be writeable) PerlSetEnv OCS_OPT_LOGPATH "/var/log/ocsinventory-server"
PerlSetEnv OCS_OPT_WEB_SERVICE_ENABLED 0 PerlSetEnv OCS_OPT_WEB_SERVICE_RESULTS_LIMIT 100 # PerlSetEnv OCS_OPT_WEB_SERVICE_PRIV_MODS_CONF "WEBSERV_PRIV_MOD_CONF_FILE"
PerlSetEnv OCS_PLUGINS_PERL_DIR "/etc/ocsinventory-server/perl" PerlSetEnv OCS_PLUGINS_CONF_DIR "/etc/ocsinventory-server/plugins"
# SSL apache settings #SSLEngine "SSL_ENABLE" #SSLCertificateFile "SSL_CERTIFICATE_FILE" #SSLCertificateKeyFile "SSL_CERTIFICATE_KEY_FILE" #SSLCACertificateFile "SSL_CERTIFICATE_FILE" #SSLCACertificatePath "SSL_CERTIFICATE_PATH" #SSLVerifyClient "SSL_VALIDATE_CLIENT"
AuthName "OCS Inventory SOAP Area"
Communication server installation is now finished. You will be prompted to set Administration console up. Enter “y” or validate to set Administration console up, enter “n” to skip Administration console installation. CAUTION: Setup now install files in accordance with Filesystem Hierarchy Standard. So, no file is installed under Apache root document directory (Refer to Apache configuration files to locate it). If you're upgrading from OCS Inventory NG Server 1.01 and previous, YOU MUST REMOVE (or move) directories 'ocsreports' and 'download' from Apache root document directory. If you choose to move directory, YOU MUST MOVE 'download' directory to Administration Server writable/cache directory (by default /var/lib/ocsinventory-reports), especially if you use deployment feature. ```Where to copy Administration Server static files for PHP Web Console [/usr/share/ocsinventory-reports] ? Configuring / Installing IPDISCOVER-UTIL Perl script. Fix directories and files permissions to allow Apache daemon reading and writing to required directories (write access is required in /ocsreports, /ocsreports/ipd and /download, cf § 11.4 Files and directories permissions under Linux.). Configure PERL script ipdiscover-util.pl to access database and install it. Now, you can restart Apache web server for changes to take effect. Else, open your favorite web browser and point it on URL http://administration_console/ocsreports to connect the Administration server. As database is not yet created, this will begin OCS Inventory setup process. Otherwise, you can rerun configuration process by browsing http://administration_console/ocsreports/install.php URL (this must be used when upgrading OCS Inventory management server). Note: You will see warning regarding max size of package you will be able to deploy. Please, seeUploads size for package deploymentto configure your server to match your need. To secure your server, refer to Secure your OCS Inventory NG Server documentation. If you don't want to secure your OCS Inventory Server, you have to desactivate Warning message in user profile. Procedure is in the same documentation page. Warning: We recommend you to read this documentation and follow the procedure. Click on the following link : "Click here to enter OCS-NG GUI"
Just point your browser to the URL http://administration_server/ocsreports and login in with admin as user and admin as password.